Alternanthera dentata, or Purple Knight all planted up! 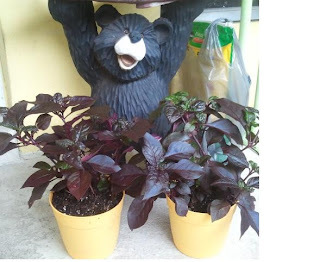 I dug up my two largest plants, which I had started from rooted cuttings (yay)...and planted them in these pots for my aunt and cousin to take across the state and see how they do there. I hope it works out well. My cousin arrives today to help me with cleaning out Moms house. I have to tell you all (since I had shared about getting the library job with you), that after working there 6 weeks, I realized I would not be able to handle everything with Moms estate, the family and working full time. I had to leave my beloved library job! I still feel that it was the best thing for me, and for our family. 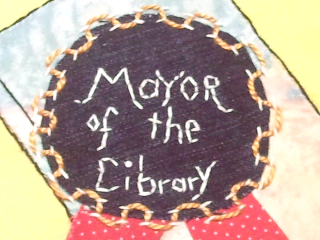 I guess the only "Mayor of the Library" title will be an imaginary one! LOL. (See previous post). 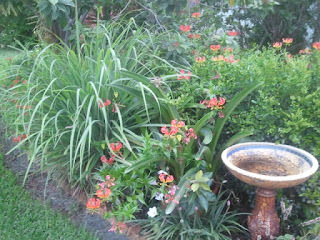 It is a rainy weekend here with the tropical event happening out in the Gulf of Mexico. They still don't know where it will go, but most models have it heading through central to north Florida. Our biggest threat will be flooding. 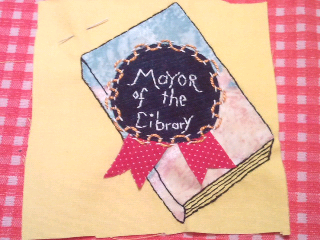 I was "Mayor" of the Library! Have you ever heard of, or used the APP called Foursquare??? It is used to "check in" at different locations that you go to throughout your day. Many places offer "specials"...like a % off, etc. You can also see where any of your "friends" go too, and leave tips about what to eat, etc. When you have gone to a spot more than anyone else, you become the Mayor of it. Well, one day I checked in to my closest library and at the same moment I found out no one else had checked in there, I found out I was the Mayor there!!! It was funny...I became Mayor by default! I decided to try and make a patch (as a joke) and did my first really crappy try at applique, and added some embroidery. I do like the technique I used to frame out the circular part of the award...it looks kinda cool, and seemed to add a nice touch. I tried sewing down the red ribbon parts, but it looked bad...they needed to hang freely. 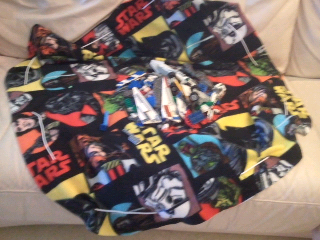 Then i tried to whip stitch the edges...and it really looked crappy! 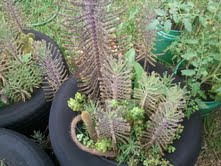 In the end, i am leaving them as they are. I planned to finish around the edge of the book with a tight zigzag using the sewing machine, to use it as a patch on the front of a fabric book cover, but now, i believe it will remain in it's current state of mess and will be sewn into my embroidery book as a fun momento of a strange, and meaningless happening! Can you believe that I have nothing to say??? I've been busy working over at Moms house, and other than that, I have done a smidgen of attempted embroidery, and could not stay focused. This is a problem. 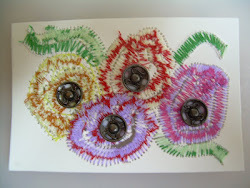 I am searching for embroidery stuff everywhere I can think of...DMC, blogs, the web, books, etc., and never really find what I am looking for. What am I looking for??? I'm not even sure. I have begun to think I enjoy a quest more than the finding, and I never like them to come to an end! 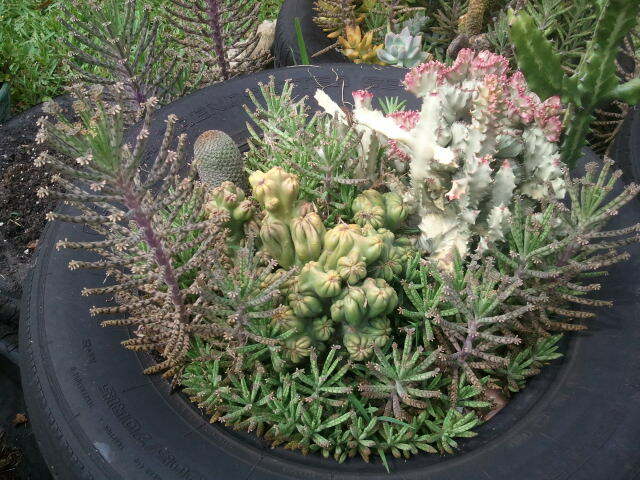 Are any of you like that??? 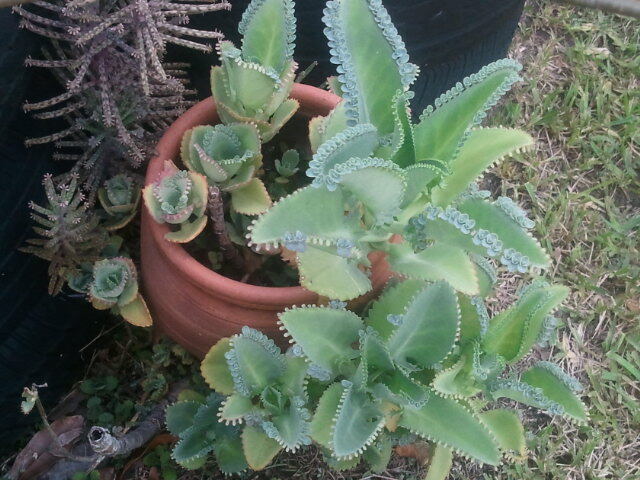 My kalanchoe is looking lovely right now with little leaflettes all along the edges of each large leaf. This is my favorite succulent of all, but then again I think I could have mentioned that a few times before. hehehehe. 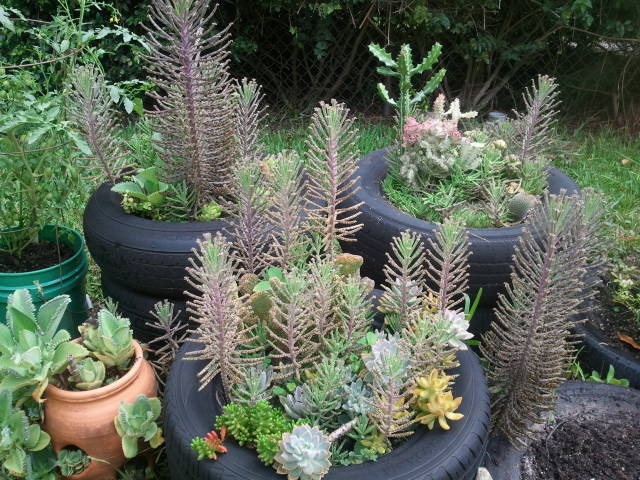 Kalanchaloe daigremontianum on right in stawberry pot, and Kalanchoe tubiflora on left alongside of tires. So, I am busy every day, but still looking for a great beginning to something fun...an adventure, a new start. Have any of you had a new adventure recently...or started something very exciting??? 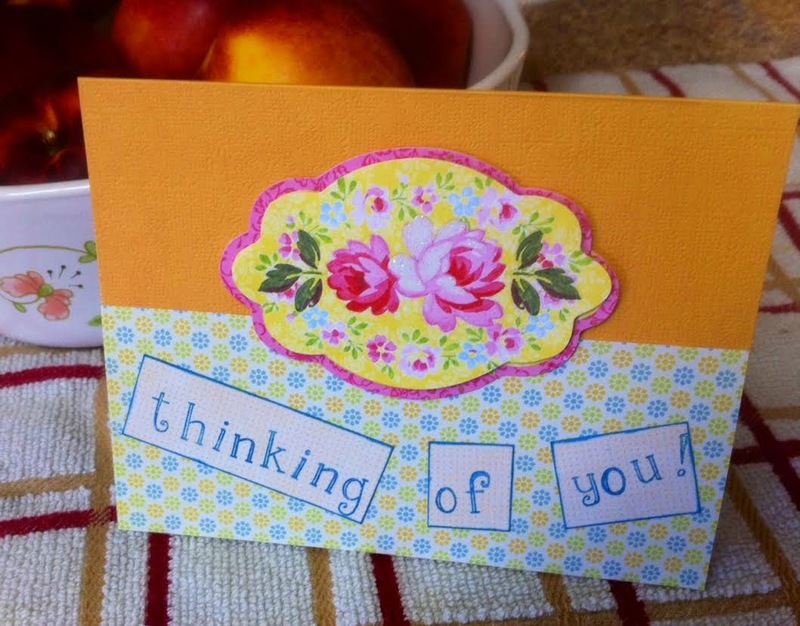 Looking forward to hearing from you if you have! 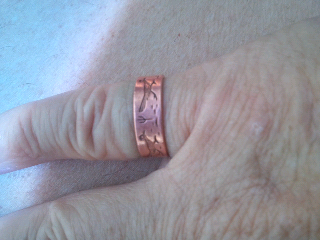 A copper ring that is engraved with what looks like roadrunners, and small saguaros! She must have picked it up on one of her trips out west...or maybe my Dad had brought it back to her from one of his trips (he recruited at university's at times). Anyway, it was all tarnished, so i researched ways to clean copper, and tried the first method, which was to pour vinegar over it, then add salt. As soon as i poured in the salt, the ring changed color...right back to it's lovely shiny new copper look...and i fell madly in love! 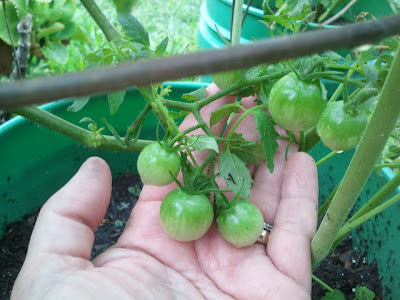 I think the green finger that results will be well worth the Mom love I feel while wearing it. P.S. 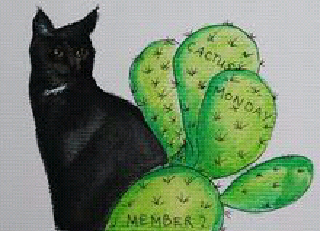 The Cactus Monday group icon picture, features our dear blogging friend, Marianne's recently departed cat, Sjimmie, who we loved so much and will sorely miss. Rest in peace dear Sjimmie. Xoxo. 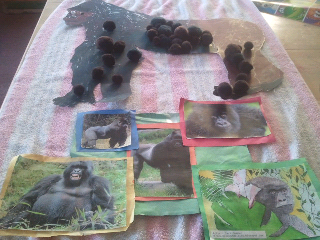 We printed pictures, and found interesting facts regarding gorillas for Donovan's classroom project (1st grade). 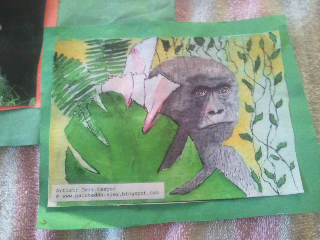 When we Googled "gorillas", one of the first photos to show up was one watercolor my friend, Teri...over at Teri's Painted Daisies had done. I emailed her to see if Donovan could use her painting...and she gave him permission. Thanks, Teri....i think your painting took the project to the next level, and it made it really special for us!!! We sent all our photos and information in, and the teachers assisted them to put it all together. 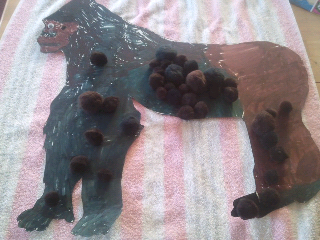 Donovan made the giant gorilla, and with the addition of some black and brown large puff balls...he became 3D. Cute! 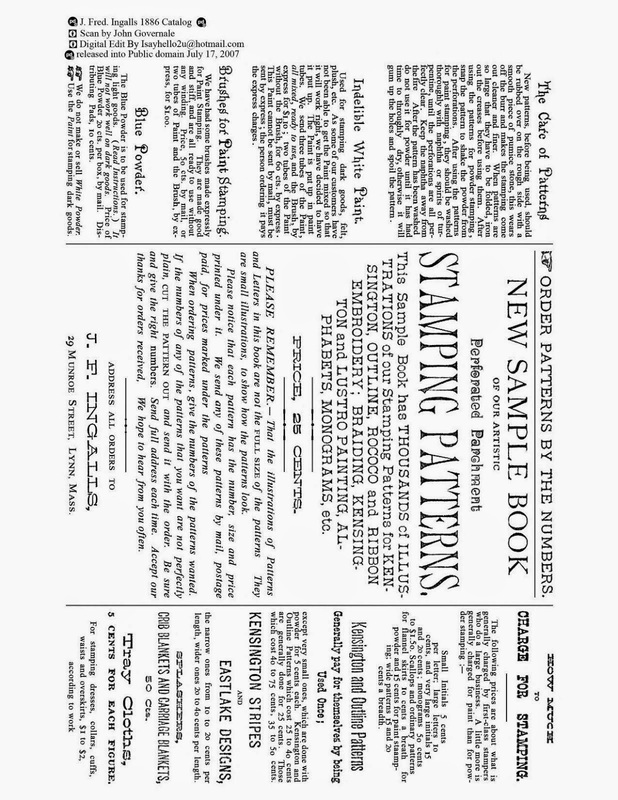 We did not get any of the infomational part back. 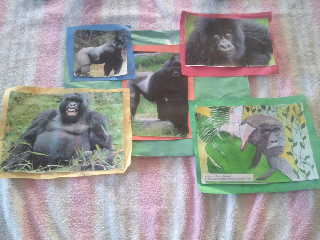 Gorillas are very interesting creatures! Have a nice Fathers Day weekend everyone! 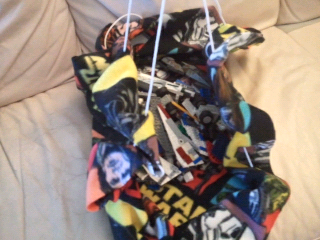 My version of Lego play bag! 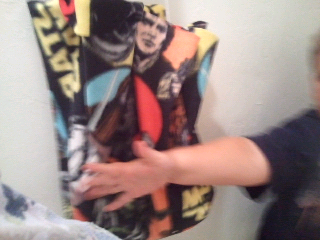 There is a neat bag you can buy online that is perfect for storing Legos...it opens up to a large circular play area, and when you are done playing, you pull up the encased drawstring around the outer edge, and it pulls the cloth up and into a bag....capturing all the little billions of Legos inside it 's purse! 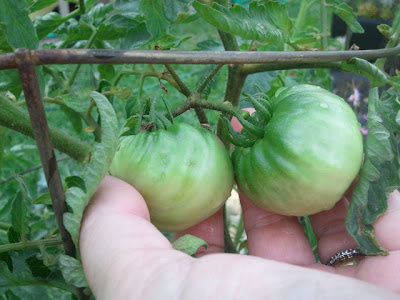 We decided to use fleece, cut small slits at intervals in a few inches from the outside edge, and ran a small rope in and out around through the cuts. When you do this make sure you have your material spread out, and make it right about that same size...then when you pull up the bag using 2 string parts opposite each other, it will pull up into a purse of sorts. My grandson, and his friend too, love playing Legos this way....no fuss, no muss....easy open, easy to travel with...and no clean up! If you have any Lego lovers around...give it a try! Here is what months of neglect gets ya! I went out this morning and pulled out most of the weeds, but the Mother Of Millions/Thousands have taken over!!! They are such trashy little monsters, but yet they are so cute and endearing! I really don't mind them being around...as long as I can keep them thinned out a bit. 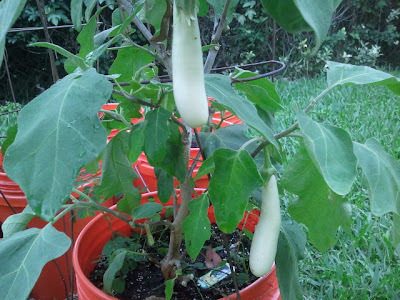 A few eggplants that remain after a little Emily girl came out and ripped 4 off the bush for Grandma Julie! LOL. 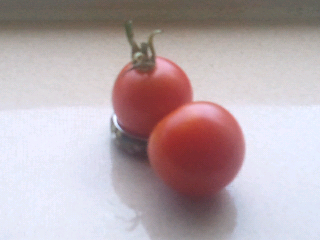 Luckily 2 of them were nearly full sized!!! 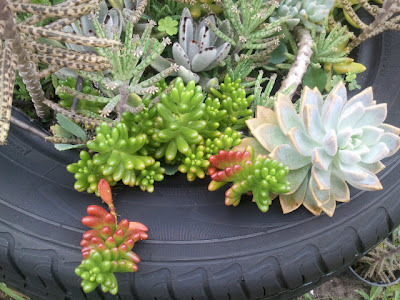 I love how these jelly bean-like succulents turn red in the full sun! It is raining out now. I am about to wake my daughter and we will go over to Moms to begin a long cleaning out process... On a good note, my cousin called and she can come in a few weeks to help with that! God bless her! 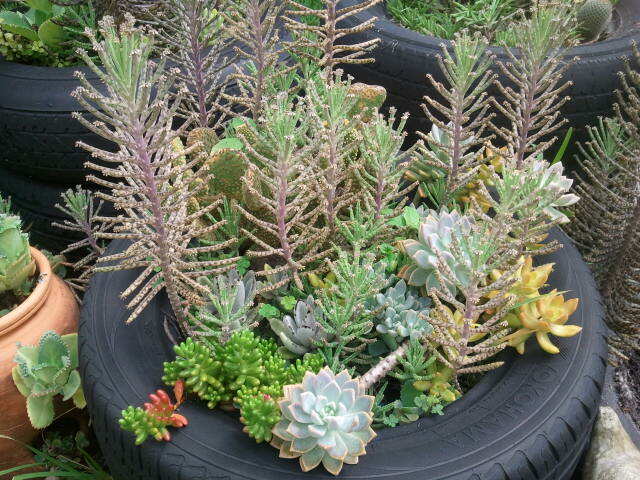 Everyone have a wonderful weekend!!! 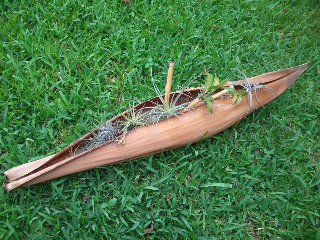 A few weeks before my Mom passed away, she had found this canoe shaped piece of palm tree debris. She wanted us to plant it up with flowers. We never got it done. 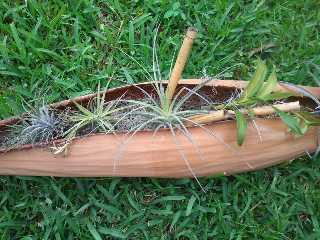 About a week after she died, my sweet sister-in-law planted it with air plants....so cute! 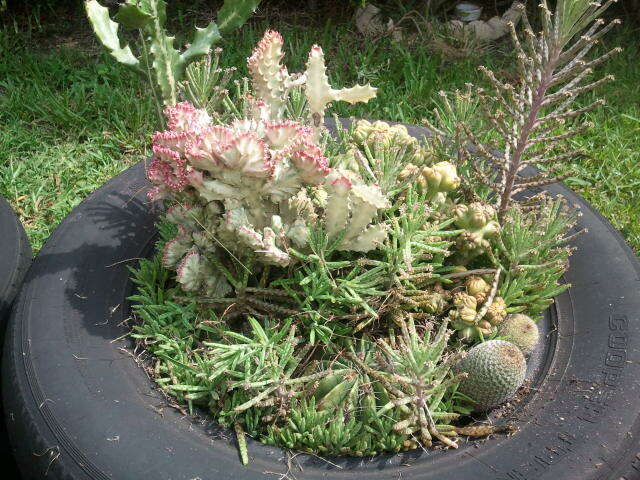 Didn't it turn out so prettily??? 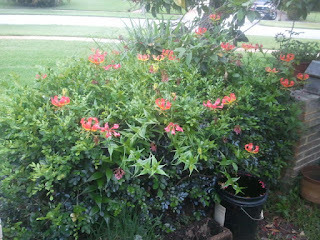 We keep it on her front porch, and once a week i am trying to remember to give it a little drink. I was at Mom's house today and when I came out the front door, I found that the gloriosas have taken over her front garden, and even growing all into her front bushes. You can see that here. They are so beautiful! This is their time to shine. 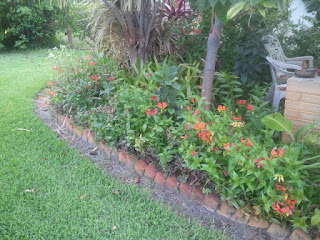 Here are two more views from the front side of her garden area where you can see them everywhere! 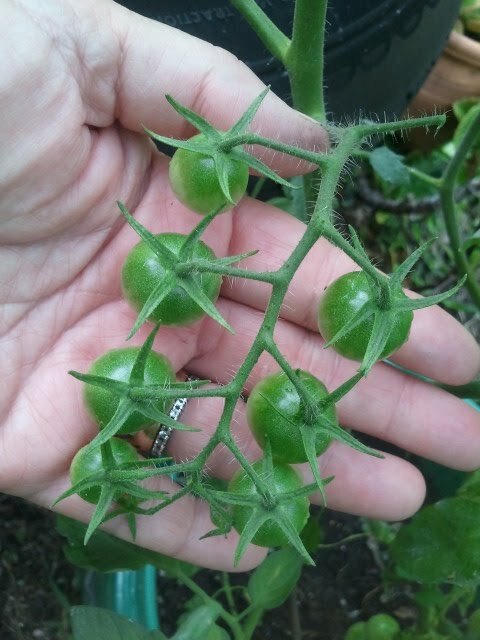 If you click on them, you can see more detail of the flowers. 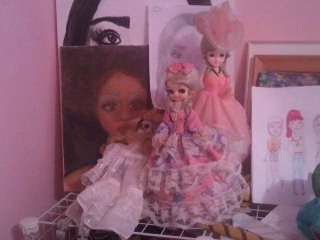 Doll collection and my vegies from yesterday. I thought i would post most of my daughters doll collection, as she has recently added a few "My Little Ponies" as well. 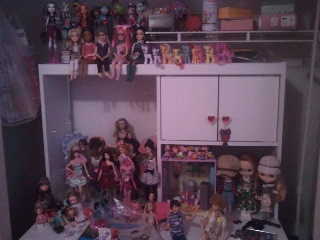 She really has a fun collection, with many ball jointed dolls and the Monster High group as well. 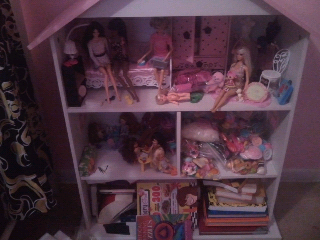 A few special Barbies too. 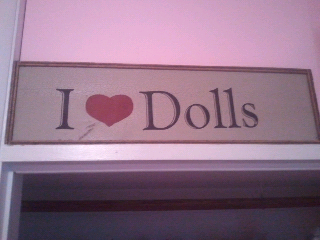 She has the sign over her closet...we found it in an antique store a few years ago (definately not an antique though). I came home yesterday and found 4 of my Sweet 100 tomatoes had turned red. I ate one, and Emily thought she would like to try one...but it was found later under the couch!!! Ha...will that gal ever eat a vegie??? Hehehe...maybe one day! 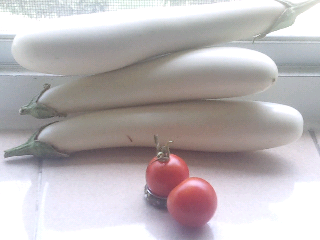 I just love my cute white eggplant! 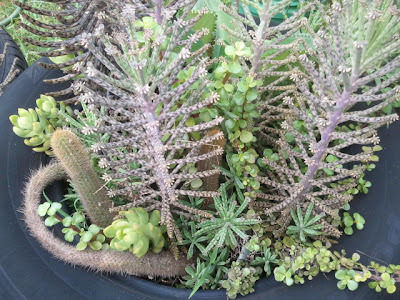 So easy to cut up...and fun!